Size: 3" bottom diameter; 6" top diameter ; 5" tall. ● Different styles can be selected as you like to decorate your light fixture, add elegant and warm atmosphere to your dining room, living room, bedroom, child room, corridor, cafe and office. ● Easy to clip on the bulbs without clip adapter, tighten enough to hold the shade in place tightly, apply to E12 bulbs. ● Cream white lamp shade with good texture, allows plenty of light to shine through, you could read books to relax ,focus on study or work. ● Rust resistant metal frame with a rolled edge, look high end and sturdy. The shades fit for chandelier, table lamp, wall lamp and so on. ● Good quality with great price, spend less and give your light fixture a whole new appearance. You are worth to own it! 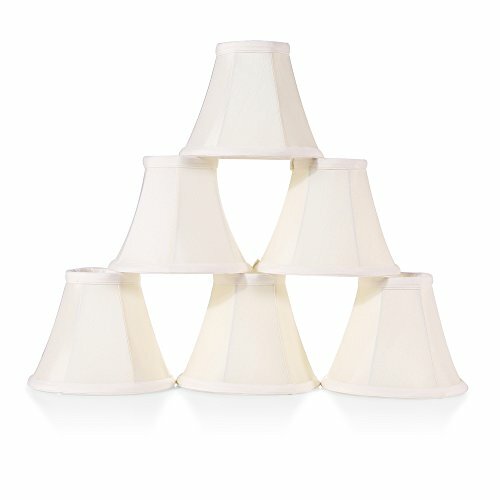 ● 6 lamp shades in one package. Well package to keep it perfect in transit, do not worry the damage of shades. Easy to install without clip adapter, tighten enough to hold the shade in place tightly. Elegant chandelier shades with different styles give your light fixture a new appearance. Well made with great price, spending less than replacing a whole fixture light. Lamp shade made with cream white faux silk gives off plenty of light, is suitable for you to read books, study or work. Delicate lamp shade create soft and warm atmosphere for your living room,dining room, bedroom, kitchen, study, guest room, corridor, cafe and new home. Small size for chandelier, table lamp, wall lamp, 3" bottom diameter; 6" top diameter ; 5" tall. Pack of 6 shades with careful package, fit for clip-on E12 bulbs. If you have any questions about this product by Chende, contact us by completing and submitting the form below. If you are looking for a specif part number, please include it with your message.